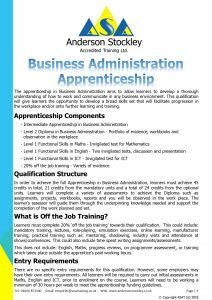 The Business Administration Apprenticeship aims to allow learners to develop a thorough understanding of how to work and communicate in any business environment. This qualification will give learners the opportunity to develop a broad skills set that will facilitate progression in the workplace and/or onto further learning and training. In order to achieve the full Apprenticeship in Business Administration, learners must achieve 45 credits in total, 21 credits from the mandatory units and a total of 24 credits from the optional units. Learners will complete a variety of assessments to achieve the Diploma such as assignments, projects, workbooks, reports and you will be observed in the work place. The learner’s assessor will guide them through the underpinning knowledge needed and support the completion of the work planned and set. What is Off the Job Training? Learners must complete 20% ‘off the job training’ towards their qualification. This could include: mandatory training, lectures, role-playing, simulation exercises, online learning, manufacturer training, practical training such as: mentoring, shadowing, industry visits and attendance at shows/conferences. This could also include time spent writing assignments/assessments. This does not include: English, Maths, progress reviews, on programme assessment, or training which takes place outside the apprentice’s paid working hours. There are no specific entry requirements for this qualification. However, some employers may have their own entry requirements. All learners will be required to carry out initial assessments in Maths, English and ICT, prior to enrolment on the course. Learners will need to be working a minimum of 30 hours per week to meet the apprenticeship funding guidelines.